Last week, the food industry congratulated itself for cutting calories from its products after one major corporation, General Mills, announced that Cheerios would henceforth be free of genetically modified organisms (GMOs). Both stories generated plenty of media attention, and in an era when food companies are widely criticized for their poor quality foods, the industry needs all the good press it can get. But if you scratch just below the surface with both of these stories you’ll find little more than meaningless “changes” made for appearance’s sake. But when it comes to original Cheerios, the company saw great public relations and sales opportunities to easily change its corn starch to the GMO-free variety and to switch from sugar made from sugar beets, which are genetically modified, to cane sugar, which is not. So it’s not as if Cheerios is the first in a long list of GMO products to be eliminated by General Mills. More likely, the company expects a significant return on its investment in the form of boosted sales given Cheerios shiny new GMO-free label. Once again, the Big Food players get to decide when and in what context they wish to let the American people know exactly what is in their food. Voluntary labeling of GMO foods is problematic for a number of reasons. First, using a new label announcing GMO-free status on foods could be used as another marketing ploy to further confuse consumers. Many consumers have a vague idea of what GMOs are and may think it’s best to avoid them based on the surrounding controversy. Indeed, this might make them more inclined to buy a product with the GMO-free label, even if the product isn’t healthy at all—which is likely what General Mills is banking on. This kind of voluntary label could become another case in which products take on a “health halo” despite being junk foods; similar to products that have increased sales to consumers looking to improve their diets by boasting claims like “low-fat” or “gluten-free,” while being loaded with sugar and other highly refined ingredients. Cheerios, it should be noted, already carry a health halo with the whole-grain check mark certified by the American Heart Association and the claim to lower cholesterol both on the box. 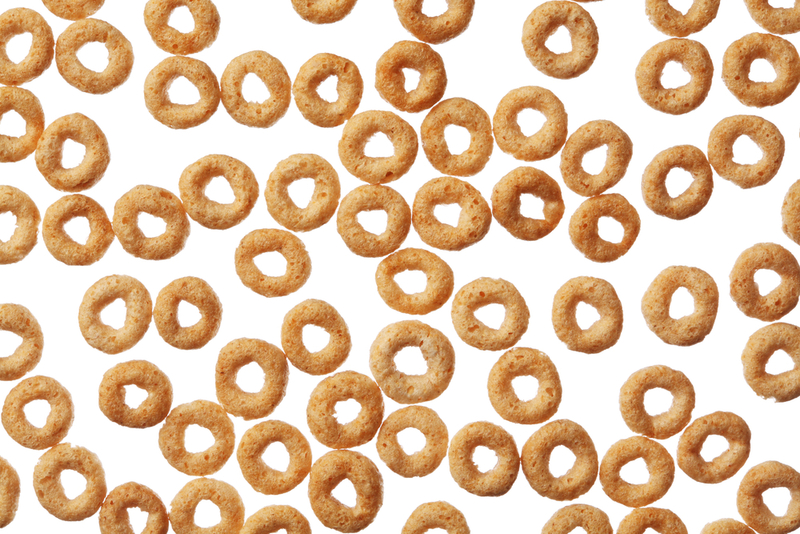 But Cheerios are not a health food—they consist of a grain that has been ground and puffed into a processed cereal with added sugar, corn starch, and the additive tripotassium phosphate (used in foods for regulating acid and emulsifying, it’s also used as a degreasing agent, a stain remover, and a general cleaning agent). In short, they are a highly processed product best to be avoided. Another problem with voluntary labeling of GMO foods is that it continues to place the burden on the consumer rather than the producer. Consumers are currently forced to navigate a confusing and cluttered food landscape. Mandatory labeling, either at a state or federal level, would enable consumers to make one simple and clear decision about GMOs. As it stands now, consumers might decide to opt for GMO-free Cheerios rather than an organic product without the GMO-free label. That’s because, as Mark Bittman points out in The New York Times, organic companies that already have an organic label cannot put a GMO-free label on their products—the idea being that consumers should know that organic means GMO-free—but this is not universally understood. In another separate, but related obfuscating tactic, the food industry announced to much fanfare that it cut 6.4 trillion calories from its products in 2012. That’s a big number, but what does it actually mean? Not much. This vaguely described reduction in calories might matter ever so slightly under one condition: If all calories were created equal. But, as I’ve written before, that is not the case. The type of calories we consume matters much more than the amount. Even according to the industry’s skewed logic—that cutting any type of calories leads to weight loss—the 6.4 trillion calories they cut only represents about eight percent of the total number of calories the food industry pumps out a year, which is double the amount of calories needed for every American. This convenient public relations announcement feeds into the industry’s two false precepts: “All calories are the same” and the “personal responsibility” of the eater, while simultaneously absolving corporations of any commitment to change the actual content of their unhealthy food products. “The industry hasn’t dealt with the real issue; 6.4 trillion calories sounds good, but the devil is in the details and they don’t want you to know the devil or the details,” Lustig said. But what else can we expect from an industry that functions virtually unregulated while fighting aggressively against any kind of labeling or transparency for the consumer? When it comes to food in America, it’s like the Wild West—the industry writes its own rules and the consumer is forced to make tough decisions in a confusing and unhealthy food landscape. Great writeup. Keep us informed. Our campaign to label GMO foods is turning out to be far less damaging to corporations and commercial farmers than we had expected. We have given them another "health halo", as you call it, to bolster their marketing. Maybe we didn't think through our "Just Label It" campaign quite as well as we should have. We need to insist in banning GMO if we fear those or we should insist on censorship in advertising if it is our intent to attack corporations. Either way, now it looks like our labeling initiative was off the point and, worse, it is being used against us. "Our campaign to label GMO foods is turning out to be far less damaging to corporations and commercial farmers than we had expected." This sounds like a pretty explicit statement that the real goal of the GMO-labeling movement is forcing the corporations and farmers out of business. I'm struck once again by the appearance of the rich urban hipster fantasy that we can have a society where you are well fed while only 2% or less of the population works in agriculture. Put the food corporations and commercial farmers out of business and a lot more people will have to work in ag producing substantially higher-priced food. Maybe that's fine for you, but it's probably not fine for a lot of other people. There are a large number of people living at the edge of hunger, even in the US. http://www.forbes.com/sites/robwaters/2014/01/06/new-study-reveals-the-hidden-health-cost-of-cutting-food-stamps/.